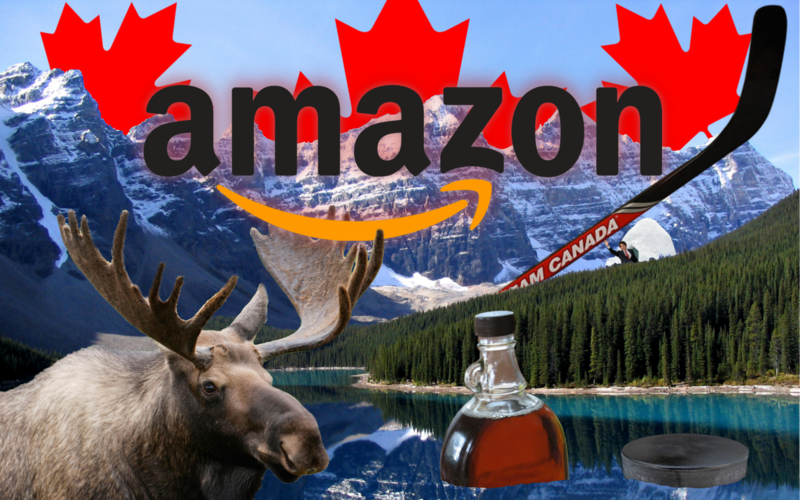 So far only three of Amazon's Echo products are available in Canada. For a limited time, you'll be able to pick up the Echo for CDN$ 99.99, the Echo Dot for CDN$ 49.99, and the Echo Plus for CDN$ 169.99. Prices for each will later rise to CDN$ 129.99, CDN$ 69.99, and CDN$ 199.99, respectively, so this represents a non-trivial 28-16% discount. Pre-orders are live now, though none of the hardware will be released until December 5th. On the fence? Check out our review of the 2nd gen Echo Dot to see what Alexa in hardware is all about. Canadians can even enjoy "skill" integration with Air Canada, TD Bank, TELUS, CBC, The Weather Network, Bank of Montreal, Manulife, Aviva, and Yellow Pages, among other regional services. Whether you grab an Echo or not, you'll also be able to take advantage of the new Canadian launch of Prime Music, too. With Prime Music, you can listen to over a million songs (two million in the US) as well as an extensive selection of curated playlists in Amazon's streaming library for free as part of your Amazon Prime membership. That's not a bad deal if you've already got Prime for the streaming video or shipping advantages. One of the better things about Amazon's Alexa platform is the fact that they've made it so open for developers, and Canada is able to get in on some of that action, too. Now the Alexa Skills Kit is available in Canada, allowing developers in the country to add new skills and features to Alexa, and a ton of Canadian companies like TELUS and CBC have already jumped in on the action. Amazon's Alexa Voice Service is also available in the region now, so third-party hardware manufacturers like Toronto-based Fabriq can finally bring Alexa to a Canadian audience via their hardware. In both cases, it seems that support is a bit more limited in Canada than in other markets. 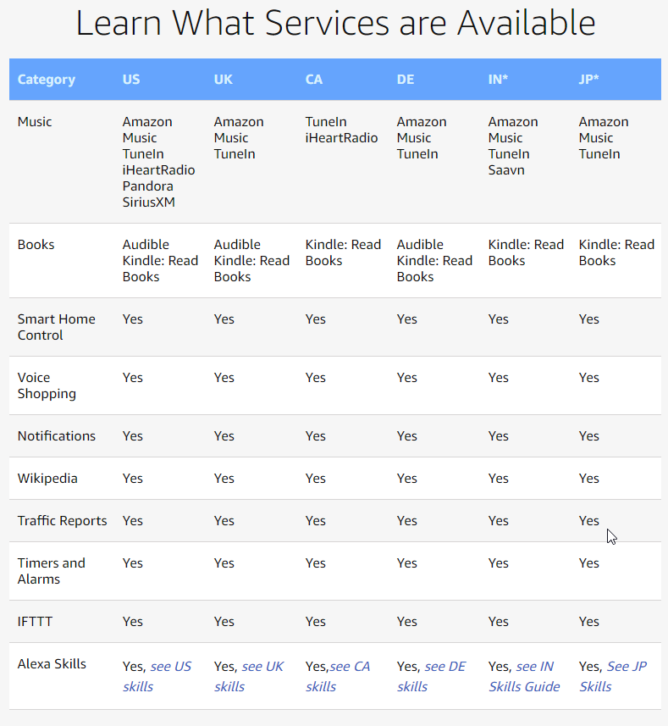 For example, not all music streaming services are available via Alexa in Canada, and Audible audiobooks don't seem to be supported. It's early yet, though, so the list of compatible services is bound to expand. What a wonderful day for Canada, and therefore of course, the world. SEATTLE – (BUSINESS WIRE) – November 15, 2017 – (NASDAQ: AMZN) — Amazon Canada today announces the launch of Prime Music, making it possible for all Amazon Prime members in Canada to listen to more than one million songs, on-demand by chart-topping artists, along with hundreds of hand-curated playlists and personalized stations. Now included with every new and existing Prime membership, customers in Canada can begin streaming Prime Music today within the Amazon Music app for iOS, Android, Mac, PC, Fire TV Stick Basic Edition and on any Web browser at www.amazon.ca/primemusic. In addition, customers who pre-order the recently-announced Echo devices at www.amazon.ca/echo will be able to start streaming Prime Music when Echo begins shipping in Canada on December 5 and conduct their listening experiences through natural voice controls powered by Alexa, Amazon’s cloud-based voice service, for the first time ever. SEATTLE — November 15, 2017 — Amazon today announced the expansion of the Alexa Skills Kit (ASK) and the Alexa Voice Service (AVS), enabling developers around the world to build voice experiences for Alexa customers in Canada. The Alexa Skills Kit (ASK) is a collection of free, self-service APIs and tools that make it fast and easy for developers to create skills, or capabilities, for Alexa. With ASK, designers, developers, and brands can build engaging skills and reach millions of customers in the US, UK, Germany, Japan, India and now Canada. Developers don’t need to have a background in natural language understanding or speech recognition to build an Alexa skill. From daily news updates, to interactive games, to smart-home integrations, developers from Canada and all over the world are creating voice-first experiences with Alexa. Whether it’s computing power, database storage, or content delivery, AWS has a wide range of services to help developers build sophisticated applications with increased flexibility, scalability, and reliability. The easiest way for Alexa skill developers to connect their skill to the cloud is to use AWS Lambda, an innovative compute service that runs code only when needed and scales automatically, so there is no need to provision or continuously run servers. Developers can also enhance and scale skills using additional AWS offerings such as Amazon Elastic Compute Cloud (Amazon EC2), Amazon Simple Storage Service (Amazon S3), Amazon DynamoDB, and Amazon CloudFront. Using the Alexa Skills Kit, TD Bank has built a skill which allows its Canadian customers to ask Alexa for information about TD products and services, locations of TD branches, and even exchange rates. "We're thrilled to be working with Amazon to bring voice interaction to our customers alongside the launch of Alexa for Canada," said Rizwan Khalfan, Chief Digital and Payments Officer for TD. "We're focused on enabling customers to bank when, where, and how they prefer, through personalized connected experiences. Voice interaction supports this vision and takes us another step forward as we develop new ways to simplify our customers' lives through smart innovations that connect our customers with what matters most to them." CBC, Canada's Public Broadcaster, will provide Flash Briefings including CBC News: The World This Hour (updated hourly) and CBC News: Local News, which will provide audiences with news from 13 regions across Canada updated throughout the day. In addition, CBC will soon introduce a custom skill which will provide on-demand access to hourly updates from CBC News as well as 30 regional streams from CBC Radio One. "We are always looking for innovative ways to bring stories to Canadians, and Alexa makes it easier than ever for our audiences to connect with us,” said Lauris Apse, Senior Director, Digital Products, CBC. We invite developers to join the Alexa team at upcoming workshops, webinars, and other in-person events to learn about building Alexa skills. Get started at: https://developer.amazon.com/alexa-skills-kit/. The Alexa Voice Service (AVS) enables developers to integrate Alexa directly into their products, bringing the convenience of voice control to any connected device. AVS provides developers with access to a suite of resources to quickly and easily build Alexa-enabled products, including APIs, hardware development kits, software development kits, and documentation. Through AVS, device makers can add a new intelligent interface to their products and offer customers access to a growing number of Alexa features, smart home integrations, and skills. Starting today, hardware manufacturers can begin developing Alexa-enabled products for Canadian customers with the Alexa Voice Service. Ultimate Ears is known for its portable, wireless speakers with amazing 360-degree sound, and Amazon Alexa is integrated into their newest speakers, BLAST and MEGABLAST. "Ultimate Ears BLAST and MEGABLAST bring Alexa and music together in a portable, waterproof, ready-for-anything design," said Charlotte Johs, general manager of Ultimate Ears. "Customers in Canada can take these speakers and Alexa anywhere, with up to 12 to 16 hours battery life and far-field, hands-free, voice control with Alexa when connected to Wi-Fi or a mobile hotspot." Toronto-based FABRIQ delivers high quality, affordable devices for the smart home. It is bringing its popular Chorus multi-room speakers with Amazon Alexa to customers in Canada. “The Chorus speaker with Alexa delivers excellent audio, multi-room capability, voice functionality, and affordability,” said Jordon Sansom, Director of Marketing, FABRIQ. "We're excited to bring FABRIQ home so Canadians can experience Alexa for themselves." Developers can start building with AVS for customers in Canada today. To learn more and get started visit: https://developer.amazon.com/alexa-voice-service/international/.